The Louis P. and Clara K. Best residence and auto house was built in 1909 at the top of the bluff at 627 Ripley Street in Davenport, Iowa. Designed by the prominent Davenport firm of Clausen and Clausen, it is locally significant because it is a high style and a very large example of the Spanish Mission Revival style of domestic architecture, and it is one of the first examples of “fireproof” (an obsolete term meaning fire resistive) residential construction in the Davenport Tri-City area. Additionally, it is locally significant because it is closely associated with the life of Louis P. Best, a successful industrialist, financier, and chemist, involved in corn processing and other major industrial and real estate interests. The Best Mansion was constructed in 1909 in an early residential district located along a hillside and bluff overlooking downtown Davenport, Iowa. Residential construction in this fine old neighborhood, now known as the Hamburg Historic District NRHP1983, began when the town was platted in 1836. The majority of the existing housing stock dates to the period of 1855-1900 and was largely built by German immigrants. The area located along the upper slopes of the bluff became known as the Gold Coast and was preferred by the more affluent families who built impressive mansions. By 1909, most upscale residential construction was occurring in new prestigious developments such as McClellan Heights, Oak Lane, and Vander Veer Park, located in outlying areas of the city. Contrary to then current trends, Mr. and Mrs. Best chose their old neighborhood as a building site, even though this necessitated the moving of a very large Queen Anne Style residence and the demolition of two other wood-frame houses. While some small residences and duplexes continued to be built in the neighborhood as infill up through the 1920s, the Best residence and auto house, with twenty rooms and 8,402 square feet of finished floor space on three floors in the residence and five rooms and 2,100 square feet of floor space in two story auto house, was not only the last, it was also the largest of the mansion houses built in the neighborhood. Situated on four lots, comprising slightly more than one acre of land, it ranked as the largest property in the neighborhood as well. From the time of its completion until the death Louis Best in 1926, the residence was the home of the Best family. In 1928 the property was sold to Thomas Agar, who with great care and considerable expense converted the property to eight apartment units named the Grandview Apartments. Alterations were minimal, and all are reversible. The integrity of the original design and the building fabric has not been compromised. Louis and Clara’s decision to build a fine new home was no doubt influenced by their economic status and the fact that they could well afford a stylish home with the latest in comfort and convenience. Their decision to build a home of such large size was necessitated by family tragedy. On December 27th, 1907, Clara’s brother-in-law, Paul Karlowa died at his home located at 723 Brown Street, as a result of gas asphyxiation. He had been in a prolonged state of poor health as a result of chronic asthma and hay fever, and had become quite discouraged. On the evening of December 26th, in a state of deep melancholy he retired to his room, turned on the gas, and laid down to his permanent sleep. Only four months later, on April, 13, 1908, his widow, Emilie V. Karlowa died following appendicitis surgery. Their orphaned children, Robert, age 15; Carolyn, age 11; and Klara, age 3 became the wards of Emilie’s sister Clara, and her husband, L. P. Best. At this time, Louis, age 60 and Clara, age 44 had a young family of their own. Louis P. Jr. was age 6 and Gretchen was age 3. Planning for a new residence to accommodate the burgeoning family commenced immediately. “The biggest deal in residence property recorded here fore [sic] some time, is that which gives L. P. Best one of the finest home sites in the city. He buys the home and grounds of Henry C. Struck, Jr., on Ripley Street above Sixth. From L. W. Petersen he also buys an adjacent 80-foot lot to the east, and two more 80-foot lots on Sixth Street, giving him over half a city block of the sightliest [sic] bluff in the city, with a magnificent sweep of river view. Mr. Best expects to remove all the buildings on the property including the Struck home, and to erect a home after his own plans, on the site. That it will be a house in keeping with Mr. Best’s way of doing big things, goes without saying. His present home, at 619 West Sixth street, he disposed of some time ago, in the exchange that made him the owner of the Henley Block [a.k.a. the Forest Block] at Fourth and Brady streets. 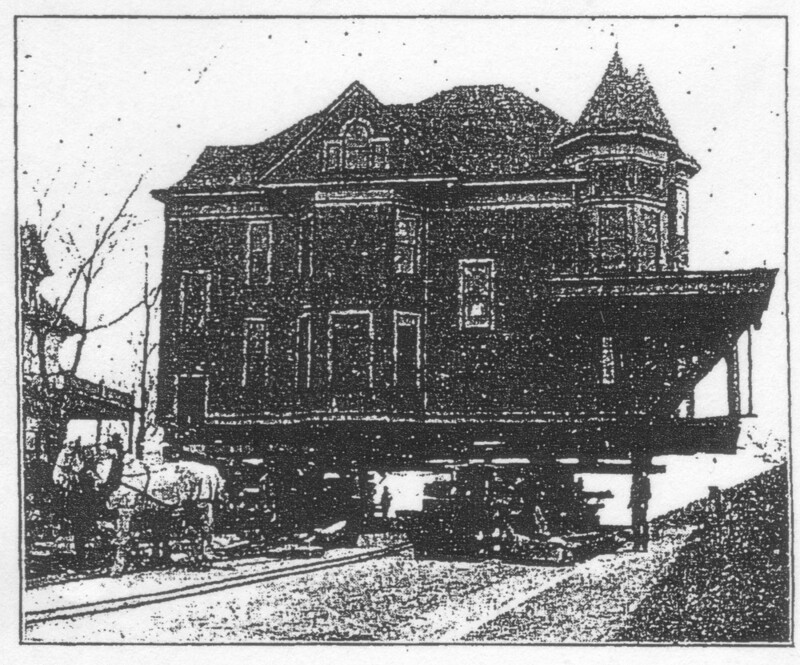 The Struck home, built in 1896, was not demolished, but was moved to a new location at 703 N. Ripley Street, being the second lot north of its original site. Struck’s new home at the corner of 6th Street and Ripley Street is a 1909 interpretation of a medieval Bavarian castle. This home, also designed by Clausen and Clausen, was under construction at the same time as the Best residence. The Best residence, designed by the Davenport firm of Clausen and Clausen, exhibits an artistic combination of the Spanish Mission Revival style and other early twentieth century design influences, Craftsman and Prairie School. The irregular shaped main house with numerous porches of varying shapes and sizes, along with the detached two-story auto house at the rear, connected to the house by a wide sweeping arch structure, creates the appearance of a grouping of separate and varied buildings, grouped together to form one single unified mass. The introduction of the Spanish Mission Revival style in the United States is attributed to the construction of the California building at the 1893 Columbian Exposition in Chicago, Illinois. The Columbian Exposition is most widely known for its introduction of the Beaux Arts and Classical Revival movements, which swept the nation. Through the construction of the California Building, the Columbian Exposition is also credited with introducing the Spanish Mission Revival style. While the classical revival movement looked to the east coast and England for inspiration, this style, which is essentially a parallel movement, looked to the Spanish colonial period of American southwest and revived its regional architecture in a new twentieth century form. This new style did not take hold in a substantial manner until the 1915 Panama California Exposition in San Diego. The buildings at this event were entirely built in the Spanish Mission style and gave birth to a much broader national movement. “W. P. Bettendorf has adopted California old mission as the style of the $50,000 residence that is to be erected for him in the spring. The preliminary plans submitted by C. R. Spink, in the competition with other local architects, were selected. Mr. Spink embodied in his plans many of the ideas he gained on a recent trip to the Pacific coast, during which he associated himself for a time with the office of one of the leading architects in San Francisco. The house will be located in Bettendorf, on a bluff formerly occupied by the Coleman home, which has been removed. There will be 20 rooms, and the house will be two stories. It will be fireproof throughout, with plaster exterior and tile walls. The dimensions of the main body will be 112 x 50, with a wing at the rear for quarters for the servants. The prominence on which the house will stand is situated just northeast of the big shops of which Mr. Bettendorf is the president. The mansion was not completed until 1910, and sadly, William died of a sudden illness a few weeks before he and his family planned to move in. It is clear from this announcement that the Best house was considered to be significant, and in the same company as the finest houses being constructed in the two cities. It is likely that Louis and Clara Best got the idea to build in the Spanish Mission style from their friend, W. P. Bettendorf. The two gentlemen had been long time friends and Mr. Best was a heavy stockholder in the Bettendorf Company, serving as a director and treasurer of the corporation for many years. It is almost certain that the two men discussed their house plans together. While Bettendorf chose architect Spink through a competitive process, Louis P. Best chose his old friend, business associate, and card playing buddy F. G. Clausen as architect. Clausen was one of the most prolific and accomplished architects in Davenport and had been working on various projects for Best almost continuously, for several years. The largest of the projects was the Best Building in downtown Rock Island. This building began in 1908 and completed in 1909, was a completely “fireproof” department store and office building. The building was six stories tall and occupied about one fourth of a city block. Design work for the Best residence would have been done while this building was under construction and construction of the residence would have begun while the business building was nearing completion. Clausen had the leading architectural practice in Davenport beginning in the 1870s, and had designed many public buildings and prominent homes throughout eastern Iowa. For several years around the turn of the century, Park T. Burrows was a partner. Burrows departed about the time that Clausen’s son, Rudolph, a 1900 graduate of Massachusetts Institute of Technology joined the firm in 1904. At that time the name Clausen and Clausen was adopted. The younger Clausen brought his excellent education and training to the firm and it is likely that he brought a modern perspective and enthusiasm for the changing styles as well. It seems likely he was the instrumental force behind the successful blending of the Arts and Crafts and the Spanish Mission Revival movement in the design and construction of the Best residence. There is little doubt that because of his education and training, he was the source of the modern “fireproof” construction methods utilized in the Best residence construction. A few days later, on May 9, 1909, the Davenport Democrat announced that a building permit had been issued to contractor Jake Sievers for a two-story brick and concrete fireproof dwelling on Ripley, between Sixth and Seventh Streets for L. P. Best; cost $20,000. This may have been somewhat underestimated because an appraisal of the property in 1922, which included the land, placed the total value at $32,500. The Best residence and auto house are constructed of hollow clay tile with stucco applied to the exterior surfaces and plaster applied directly to the interior surfaces. The house, which measures approximately thirty-eight by sixty-four feet, is covered by a central hipped roof with projecting gables at the sides and rear. The roof was originally covered with clay roof tile, giving a very Spanish appearance. The particular type of tile that was used was French interlocking tile manufactured by the Ludowici Roof Tile Company of Ohio, which is still in business today. The wide overhanging eaves of the roof are open and feature enlarged decorative rafter tails. The original large proportioned copper gutters still exist. The most distinctive Spanish Mission elements on the building are the three projecting gables with decorative parapet walls. These stucco covered walls are capped by dressed stone coping in the shapes of arches and concave curves form that a very distinctive Spanish Mission appearance. The south gable features a joined pair of round-arched windows at the third floor level. The north gable features a grouping of windows in a modified Palladian style, consisting of a central round-arched double-hung window flanked by two rectangular casement windows. The parapet gable on the rear elevation features three separate double-hung windows that are grouped together by a craftsman inspired canopy that visually unites the separate windows into a single design element. It is interesting to note that these three gables exist only on the side and rear elevations of the house. This adds to the overall irregular design emphasis and the picturesque qualities of the buildings. The front elevation of the house features a hip roof, reminiscent of the American Four-Square Style, broken only by a centrally located Spanish inspired dormer window that also exhibits Craftsman influences. The low wide overhanging eaves of the hip roof, with exposed rafter tails, serve to visually lower and widen the front elevation, which is rather narrow in comparison to the side elevations of the building. There are two other dormer windows, one on the north and one on the south, located just to the back of the side parapet gables. These dormers are barely visible from the ground and are further obscured by the projecting side gables. They are not ornamental, but are needed to provide light and ceiling height to both the third floor bathroom and the storeroom. The first story level features a series of porch structures that feature continuous horizontal elements that entirely span the front and south side elevations, being the primary elevations of the house. The reinforced concrete porch roof is supported by massive square stucco piers measuring three feet square. The piers extend up through the roof approximately three feet and terminate with a Craftsman stylized cap detail. The porch roof is flat and features a sloped parapet that was originally faced with two rows of roofing tile. In most places, the parapet wall was capped with clay coping tiles. One exception is the front elevation of the parapet above the screen porch, which was fitted with a flower box. Resting on the top of a large proportioned beam, the closed-soffit eaves are decorated with evenly spaced blocks of wood that simulate exposed rafter tails, thus mirroring the appearance of the eaves of the main roof above. The series of porches are further described as follows: at the far left side of the front elevation, there was a porte-cochere (removed in 1961). This continued to the right as a covered porch, which remains, over the main entrance to the house. To the right of this, the porch continued, but as an open deck with no roof. To the right of this, wrapping around the corner to the south elevation was a large screened porch (now enclosed). On the south elevation, running toward the back, was a structure that appears to be the continuation of the porch, but is actually a one-story extension of the living room. This feature, a conservatory, featured a continuous bank of casement windows capped by a large transom of leaded art glass. From this point running to the back corner of the south elevation is the two-story, glassed-in heated sun porch. A doorway at the second floor level provides access to roof deck of the conservatory and screened porch. The same roofing detail, as described previously continues above the first story level of the sun porch, thus visually connecting the appearance of the sun porches with the one story porches. The sun porches are supported by soaring two-story versions of the stucco piers that appear on the one-story porches. However, in this case, they extend two feet above the second story roof of the porch. The windows on the house are mostly double hung with the exception of 3 different sets of single lighted casement windows that are arranged in wide bands as well as four casement windows on the third floor. All windows on the second floor are surrounded by an eight inch wide projecting band, a typical feature of Spanish mission design. The window sills are connected by a stucco-covered belt course. The first story windows are generally less decorated, with no projecting band, however, the exception to this is on front elevation where both the entrance and the pair of windows to the right feature a projecting band. This treatment also occurs on the north elevation around the grouping of five casement windows serving the dining room and at the large window located at the landing of the staircase. The large window at the landing of the front staircase also features a craftsman detailed canopy, similar to the one located at the third story level on the back elevation. A water table is formed by a wide projecting band, similar to the belt course on the second story. The house is constructed of stucco covered hollow clay tiles measuring five by eight by twelve inches, laid on side, two courses thick. The foundation walls are also stucco covered hollow tile, resting on concrete footings. Interior bearing walls in the basement are brick. Interior walls and partitions throughout the house are masonry, being a mixture of hollow tile or brick. All floor structures, plus the porch floors and roofs, are constructed of steel reinforced concrete with hollow tile filler rows on the underside of the deck. Reinforced concrete beams are utilized in two locations where openness by eliminating a bearing wall was desired. In the basement, there is a concrete beam, supported by concrete piers. This beam supports the wall between the foyer and the parlor, as well as the floor structures connected to it. A second heavy concrete beam exists at the ceiling level of the living room and visually separates the conservatory area at the south end of the room. The conservatory, being a one story extension of the living room is constructed in such a way that there is no supporting wall beneath the second and third story wall of the south projecting gable, located directly above. Instead, support is provided by the concrete beam at the living room ceiling level. This beam is encased in oak and appears to be supported to two oak columns that are only decorative in nature. The actual structural support is provided by reinforced concrete piers, constructed within the plane of the sidewalls of the living room and extending down through the basement walls below, to concrete footings beneath the basement floor. The reinforced concrete and hollow tile floors have an overlay of oak on the first and second floors. The third floor has an overlay of fir, except the storage room and party room, which are smooth finished concrete. Bathrooms and the kitchen were finished with one inch hexagonal unglazed porcelain tile set in concrete. Only the ceiling of the third story and the roof are constructed of wood frame. The roof framing is especially heavy, with thick shiplap board sheeting, built to support the extreme weight of the original tile roof. The auto house is located behind the main dwelling a distance of twenty-three feet. The two buildings are joined by a large sweeping arch that visually ties the structures together. In addition to the aesthetic qualities, the arch functions as a route for the steam main that runs from the boiler room located in the basement of the house, to the ceiling level of the first floor of the auto house. The auto house is covered by a simple hip roof, originally covered with French tile. One ornamental dormer, with a Spanish parapet is located on the south side. The first floor of the auto house building was divided into three garage bays. Vehicle access to two of these bays was possible from both the north and the south, and the third was accessible only from the south. The south elevation of the auto house featured an arcade situated beneath a portion of the second floor, emulating an exterior arcaded corridor, a common feature in Spanish mission architecture. This feature also allowed a person to be out of the weather when operating the outwardly swinging garage doors, which were recessed in this archway corridor. The second floor of the auto house provided spacious living quarters for chauffer and his family. The rooms consist of two bedrooms, a bathroom, living room, kitchen, pantry and four ample closets. The auto house is constructed of the same materials as the house; stucco-covered hollow tile walls, concrete slab on grade on the first floor, reinforced concrete and hollow tile floor with fir overlay on the second floor with wood frame ceiling and roof above the second floor. All of the reasons for which the Mr. and Mrs. Best chose to build their home of “fireproof” construction methods may never be known, however, there are several factors and circumstances that can be documented. While these may not be all of the factors of their decision, they certainly do provide insight to personal experience, as well as local and national events that would have had an influence sufficient to create a desire for a “fireproof” home. A few years after Mr. Best assumed the management of the Davenport Glucose Works, there was a disastrous fire in 1877 that completely destroyed the factory. Having proved that the operation of the plant was capable of producing profit, the stockholders agreed to rebuild the plant, but it was at considerable cost. Mr. Best directed the construction of the new plant, which was completed in six months and subsequently, it became a very profitable venture. In 1901, an area east of downtown Davenport was the site of one of the city’s worst fires. The fire destroyed twelve city blocks and caused over $1,000,000 of damage. One of the worst fires that had occurred in the nation after the Great Chicago Fire of 1871 occurred in Baltimore, Maryland in February, 1904. This fire destroyed more than one thousand five hundred buildings in central Baltimore and caused over $150,000,000 in damage. Less than two years later, in April of 1906, San Francisco was devastated by what remains the nation’s most disastrous fire of all time. This fire did over $500,000,000 in damage and destroyed buildings over an area larger than four square miles. In April, 1907 Frank Lloyd Wright published an article in the Ladies Home Journal advertising plans for a “fireproof” home for $5000. This was a significant event, not only because it introduced the idea of a “fireproof” residence, but also because it promoted the American Prairie School Style to the American public. In 1908, the Stockman House, NRHP, based directly on this advertised plan, was constructed in Mason City, Iowa. Interestingly, the construction was wooden balloon frame and not “fireproof” in any way. Evidence that Best was interested in the benefits of “fireproof” construction is demonstrated by the fact that he began construction on a large “fireproof” store and office building in downtown Rock Island, Illinois in 1908. This building, designed by Clausen and Clausen was built of reinforced concrete and masonry and featured reinforced concrete and hollow tile floors with wood overlay. Additional fire protection features consisted of automatic sprinklers in the retail and storage areas of the building. Windows overlooking other buildings had steel frames and wire-reinforced glass. The electrical switchboard was located in a concrete vault in the basement. This building was completed in the spring of 1909 and was marked with the Grand Opening of Young and McComb’s Department Store. This completion of the Best building occurred at the same time construction of the Best residence was just getting underway. It is apparent that Mr. Best had personal experience with the effects of fire loss. This, in addition to local and national fire disasters, as well as new developments and trends in “fireproof” construction methods likely sparked his interest in the subject. The fact that his “fireproof” store and office building was under construction at the same time that his residence was being designed could certainly have raised the idea that his residence could be built with the same fire proof methods. Also, it is quite likely that William Bettendorf’s influence went beyond architectural style alone. If Bettendorf’s residence was going to be “fireproof”, then Best could build his home in the same manner too. The Best residence was not the only “fireproof” residential design by Clausen and Clausen. Concurrent to the design work on the Best residence, they were preparing plans for the “fireproof” Smith Brookhart House, NRHP in Washington, Iowa. In addition to the advanced structural engineering necessitated by its “fireproof” reinforced concrete and hollow tile construction, the Best residence featured numerous examples of mechanical and electrical engineering that were advanced for its time. The heating system consisted of a large steam boiler supplying steam or sub-atmospheric vapor to radiators throughout the house via a two pipe distribution system. At this time, hot water heat was considered to be superior to steam because it operated slightly more efficiently, was easier to regulate than the common one-pipe steam systems, and therefore provided a more even and consistent level of heat. Disadvantages of hot water heating systems existed in the practical limitations of size; particularly in the distances that lateral mains could be run and still achieve gravity water flow. A steam/vapor system at the Best house was a practical solution given that the lateral run to the auto house was extremely long and at times could be exposed to freezing conditions. Steam flows with ease through long pipe runs because it is pushed by the pressure created in the boiler. Problems in regulation that normally existed with one pipe steam systems are largely alleviated in a two pipe setup because this piping arrangement allows any radiator to be throttled to a small flow in the same way that is possible in a hot water system. Operation at sub-atmospheric pressures allowed the vapor to be generated at temperatures as low as 140 degrees F and therefore was easier to regulate in mild weather. Additional advantages existed in the Best residence steam system’s reduced risk of freezing in the piping running to the auto house. This is because there is not enough residual water in a steam main to cause damage in freezing conditions. The auto house steam main connected to the main steam header in the boiler room with a large valve with a wheel handle that allowed it to be completely shut off. The steam main to the auto house is routed under the floor of the sun porch, then up through the pier on the southeast corner, then horizontally through the decorative arch structure, proceeding to the ceiling level of the first story of the auto house. The distribution system in the auto house is located at the ceiling level of the first floor, feeding radiators in the second floor rooms above and also ceiling radiators in the garage spaces. Additional flexibility was designed into the piping and radiators in the sun porches. Since it might be desirable to turn off the heat to this space in the coldest months of the winter, there is a large shut-off valve located in the boiler room for the steam main that feeds these two radiators. Additionally, since the steam traps might hold residual water, they were remotely located in the boiler room instead of at the outlet of the radiator, thus avoiding any chance of damage from freezing. Advanced ventilation, usually only seen in public buildings was provided by two indirect radiators that were located in sheet metal cabinets hung from the ceiling in the boiler room. Ductwork provided a flow of outdoor air to the indirect radiators, which was then discharged as heated fresh air to the living space. One unit provided air through a floor register to the living room, which is centrally located on the first floor. Stale air was exhausted on the first floor from the fireplaces located in the living room and the dining room. A second unit provided fresh-air heat to the south bedroom on the second floor, as well as make-up air to the two bathrooms on the second floor and the bathroom on the third floor. The air entered the toilet rooms through an iron register located near the ceiling. Foul air was exhausted through a register located near the floor that connected to ductwork in the attic and discharged the air through a roof-mounted ventilator. The heating system was originally controlled with an electric thermostat located in the SW corner of the dining room. A remote steam gauge was located near the thermostat, so that the occupants could observe the steam pressure without going to the boiler room in the basement. Drainage on the property was provided by a storm sewer system that was completely separate from the sanitary sewer. All downspouts from the roof were connected at the ground level to cast iron drain pipes that connected to clay drain tiles approximately 5 feet below ground. The drain lines emptied into a large brick manhole, located ten feet off the southwest corner of the screened porch. The manhole is twelve feet deep. Drains enter the manhole at six feet below grade, the outlet is at ten feet below grade. The diameter at the bottom is four feet and at the top is eighteen inches. Even though the residence is located on high ground, the elaborate system of drainage was designed to assure that the basement remained dry at all times. Piping for water and gas was installed in a commercial manner. All shut-off valves in the basement are tagged with stamped metal tags that indicate what area of the house that the line serves. These valves are bronze, tapered plug valves with lever handles; a high quality type valve similar to a modern ball valve. The cold water main was 1 ½ inch galvanized pipe throughout the basement. The hot water main was 1 ¼ inch galvanized pipe. While the hot water was most likely heated by the steam boiler when it was in operation, there was also an automatic gas water heater and storage tank. The main gas line size was 1 ¼ inch, but gradually reduced in size as it progressed through the house. Gas appliances consisted of the hot water heater, gas fireplace in the dining room, gas kitchen stove, gas heaters in the bathrooms, a gas fired mangle in the laundry, and a gas kitchen stove in the living quarters above the auto house. The electrical system was served by a fuse panel measuring twenty-four inches by forty-eight inches, located in the basement. The feed to the main panel was through a two-inch conduit that runs underground from the auto house. Evidence of the original weather head for the electrical entrance is still located on the side of the auto house. It is assumed that the meter was located inside the garage space. All of the wiring in the house was in conduits concealed within the concrete and masonry construction. At a time when standard practice for residential wiring was knob-and-tube, single conductor wiring, fully conduited large capacity electrical systems were exceedingly rare. Telephone service also entered the house through an underground conduit from the auto house. Phone wires went out through conduits to five locations in the house. There was a call bell enunciator located in the kitchen. While the call box no longer exists, the conduit and wiring is still in place. Door bell buttons at the front, side, and back doors were all connected as well as a foot button in the dining room. Perhaps there may have been more call stations in the house, but at the present time that is not known. The interior of the Best house exhibits characteristics of high stylistic ideals. This is most apparent in the public rooms of the first floor, but is apparent at some level throughout the house. The fine interiors of this home are the result of superior workmanship and materials, as well as a high level of design in the Arts and Crafts Style with Classical Transitional influences. The vestibule features two identical door sets; one exterior and one interior. Both sets feature a large oak door with a large plate glass window. On either side of the doors are large art glass side lights. The art glass panels feature narrow rectangular pieces of clear glass held together with zinc cames. In the upper half of the panels there is a simple oak leaf and acorn motif that incorporates colored glass. The floor of the vestibule is finished with porcelain mosaic tile. Each piece of tile is hand cut into a different shape and set into an overall pattern, which features a cream colored field set in a pattern of swirls. Around the perimeter, there are faintly colored bands and a stylized pattern of leaves and flowers that form a border. The walls feature quarter-sawn oak paneled wainscoting five feet ten inches in height. This same wainscoting, which features an Arts and Crafts motif of incised squares and rectangles, running horizontally near the top edge of the panels, is used throughout the foyer. The foyer also features an alcove with a built-in bench. All window and door trim in the foyer is quarter-sawn oak and features slender stylized applied columns. These applied square columns are tapered with simple flared capitals at the top. There is a single doorway the opens to the living room and another single doorway that opens to the dining room, located to the back of the foyer. A wide set of pocked doors leads from the foyer to the front parlor. There is a short six-foot tall door under the landing of the staircase that leads to a wide staircase to the basement. Under the upper flight of the staircase, there is a door, which features a beveled plate glass mirror that opens to a large coat closet. The open staircase is six feet wide and proceeds up to a landing with nine-foot tall window. The newel post at the foot of the stairs, as well as those at the landing are decorated with the same tapered column motif that is found on the door and window trim. The balustrade is made of square vertical balusters that have half-round moldings applied to the front and back vertical surfaces. Near the bottom, the balusters are tied together in pairs with two horizontal pieces of wood that are detailed the same as the balusters. Near the top of the balusters, there is a small panel with an oval opening. This panel is joined between two balusters in the same manner as the lower crosspieces. The overall affect is that of a unique combination of Arts and Crafts Style with Colonial and Japanese influence. The front parlor, being the most formal, features white enameled woodwork, and is the only room in the house that did not have a hardwood floor. This room, always carpeted, features Arts and Crafts inspired woodwork with curving pedestal-like elements that support broadly fluted boards that proceed to the upper edge of the door openings. The ceiling is decorated with a large and highly decorative plaster cornice. A set of French doors leads to the former screen porch and a wide set of pocket doors open into the living room at the rear. The living room features a large Arts and Crafts fireplace, trimmed in oak, with square pilasters on each side that extend to the top of an over-mantel panel. The mantel shelf runs between the pilasters. The fireplace has a surround and hearth finished with brown ceramic tile and the original coal basket and andirons still exist. This fireplace is centered on the back wall of the living room, opposite the parlor pocket doors. The remainder of the wall, on either side of the fireplace is filled with built-in bookcases that feature art glass doors. The pattern in these doors which features a stylized grouping of linden leaves is used elsewhere in the room; namely in the narrow French doors that lead from this room to the former screened porch, and in the transom above the windows on the south. At the ceiling, there is a large cornice and frieze constructed of oak. The ceiling features a plaster molding located approximately three feet from the edge, in the pattern of fasces. The southern most portion of this room, the conservatory, is divided by a large oak beam at the ceiling and a pair of supporting colonnades. The conservatory floor is brown ceramic tile and originally featured a fountain. The conservatory, which featured a wall-to-wall band of casement windows with art glass transoms, provided a beautiful backdrop to the living room. In addition to the center light fixture, there are four small pendant lights located in the corners of the living room, and two additional pendants located in the conservatory area. Pocket doors connect the living room to the dining room. The dining room features walls paneled with quarter-sawn oak up to the plate rail, five foot ten inches above the floor. The ceilings are decorated with large proportioned beams with slightly recessed panels in the bottom faces. A fireplace is situated on the back wall. It features square columns with Corinthian capitals and a blue ceramic tile surround and hearth. This gas fireplace still features the original gas logs. On the opposite wall, there is a large built-in sideboard. This sideboard is detailed the same as the fireplace with square columns that extend up the sides with Corinthian capitals. The sideboard features beveled mirrors around the serving surface and leaded glass doors on the cabinetry above. The pattern of the leaded glass is of grapes and grapevines. This same pattern is carried throughout the room in the transoms above the casement windows, and in the china storage cabinets that are arranged on either side of the windows. In additional to the non-original central chandelier, there are four original lights with stained glass shades that are located on the beams in the four corners of the room. A large door leads from the dining room back to the butler’s pantry and the kitchen beyond. A door in the southeast corner of the room, originally led to the side entrance hall and the sun porch. Located to the back of the side hall, was the billiards room. This room had narrow strips of wood applied to the lower section of the walls, between the baseboards and the chalk rail, to form a panel-work effect. The wood trim in the room is maple or birch, with a dark finish. The south wall of the room features large plate glass French doors with side lights of equal size, thus making the wall between the billiards room and the sun porch, almost entirely clear glass. This room, through the use of the French doors could be opened to the sun porch, and used as one large space. Being a very casual and informal area, it is not known how long a billiards table was used. In the household inventory of 1926, there was no billiards table listed, and the room was referred to as the playroom. The sun porch was referred to as the breakfast porch. Although the original kitchen has been subdivided to a bathroom and bedroom, the original floor of unglazed porcelain tiles still exists under the carpet. This floor consisted of one-inch hex tiles of white with light blue accents tiles to form a decorative pattern. The second floor features rooms situated on either side of a wide central hallway. The bedrooms are spacious, but otherwise have simple finishes. The office has windows that repeat the pattern of the dining room below, with the exception that the decorative transoms feature linden leaves instead of the grape pattern. There is also a built-in bookcase with linden pattern glass doors, identical to those in the living room. The master bathroom features marble wainscoting up to the five foot level. Marble is also used to enclose the deck mounted tub. The floor is white hexagonal unglazed porcelain tile. Interior features in the basement are generally intact, with the exception of the original water heater and boiler. The drying room still has the rows of hooks on the walls opposite each other, for mounting the clotheslines. The laundry room, with plastered walls and ceilings, still has the original soapstone, three-compartment laundry sink. Also, in this room is a large floor to ceiling cabinet that is assumed to be intended for canned vegetable storage. In the wine and fruit room, the original cabinets still exist. They feature screen covered locking doors, with interior rails that are notched to hold wine bottles and shelves for canned fruit. Born in Germany on the 7th of April, 1848. Louis acquired his education in the schools in Stuttgart and Berlin and for a brief period of time served as superintendent of his father’s glucose works in southern Germany. In 1869, at the age of twenty-one, he immigrated to the United States. For five years he worked as a chemist with the Brunjes & Ockershausen Sugar Refining Company in New York, New York. About this time, a group of Davenport businessmen realized that there might be potential in processing corn to make sugar. They formed The Davenport Glucose Manufacturing Company with $20,000 in capital, and constructed buildings and equipment. The venture was the first such project in the state of Iowa, but being experimental in nature was not financially successful and after fifteen months operations were suspended. In 1874, Robert Krause, a stockholder in the company, having heard of a bright young chemist in New York, traveled there and convinced Louis Best to take over the operation of the Davenport plant. Operations over the next 2 years were not successful, but were satisfactory enough to indicate that with a larger plant and better equipment, the operation could be a financial success. In 1877, a disastrous fire completely destroyed the factory. Best had proved that the plant was capable of producing profit and stockholders agreed to rebuild the plant at considerable cost. Mr. Best directed the construction of the new plant, which was completed in six months and subsequently, it became a very profitable venture. The company continued to grow under Louis Best’s direction, with Louis becoming one of the largest owners. In 1881, operations consumed 700,000 bushels of corn. The size of the floor space in the expanded buildings was 131,000 square feet. One hundred people were employed. Water being important to the process was provided by two deep wells that produced 750 gallons per minute. There was a high brick smoke stack serving nine boilers totaling 250 horse-power, in which was consumed 6,000 tons of coal and 400 tons of coke per year. The quality of the grape sugar (an obsolete term for dextrose), glucose, and table syrups of the Davenport Glucose Manufacturing Company had a wide reputation and they were sold in all of the principal cities in the United States. Through the years, the plant continued to expand and employed over 200 people. In the mid-1890s, large financial interests in the east with connections to the Standard Oil Company formed a new company with intentions of acquiring control of the corn processing industry throughout the United States. In 1897, Davenport Glucose Manufacturing Company was sold to this newly formed conglomerate known as the Glucose Trust. A few years later the name was changed to the Corn Products Company, which continues in business to this date as an international agribusiness conglomerate. Davenport Glucose was one of the leading companies and its acquisition was a strategic priority of the Trust. In this transaction, the Davenport stockholders realized tremendous profits, with Louis P. Best being the recipient of the largest single portion. During the operation of the Davenport Glucose plant, Louis P. Best also built a second plant in Granite City, Illinois. That company was known as Best-Clymer, and after several years of profitable operations was sold for a substantial profit. The sale occurred sometime after 1915. Louis Best was also a substantial stockholder and President of Davenport Machine and Foundry, which specialized in ornamental cast iron products as well as glucose manufacturing equipment. He was a substantial stockholder and treasurer of the Bettendorf Company, which specialized in steel wagon wheels and axels for train cars. He also served as director for the Davenport Water Company, Robert Krause Overall Manufacturing Company, President of Woodruff-Kroy Company, and as a director of the Young and McComb’s Department Store for which he built a large six story building in Rock Island, Illinois. Louis P. Best also owned numerous real estate holdings, mostly commercial buildings and apartment buildings. These included the Forest Block, also known as the Henley Block, the Argyle Apartments, the Rice Flats, the Best Apartments, and the Roosevelt Apartments in Davenport, the Best Building in Rock Island, Illinois, and speculative lands in Minnesota. 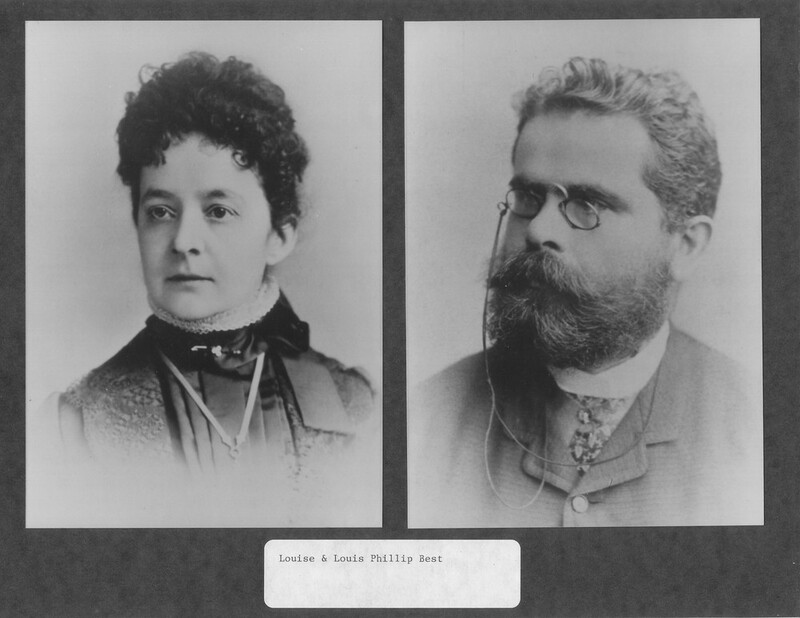 Louis Best was first married to Louise Heck in 1871. To them was born one son, Rudolph. Louise died around 1896. Best married again in 1899 to Clara Krause, daughter of Robert Krause. Clara K. Best was a sucessful business woman in her own right well before her marriage to Louis Best. Her father was a pioneer settler in Davenport and had developed a very successful clothing manufacturing company doing a big trade in overalls. Clara was involved in the day-to-day management of this corporation and for many years served as the treasurer. To Louis and Clara were born to children, Louis and Margaret (Gretchen). Clara died in 1922 after a long illness. Louis continued to live in the family home with his two children and a niece until his death in 1926. After Louis’ death, neither of the children chose to remain in the house, both of them building new homes in the McClellan Heights subdivision on the east edge of Davenport. After being on the market over a year, the grand home was sold through a trade of farm land with Thomas Agar, who immediately began the conversion of the property to eight apartments at a cost of $5,000. This was completed in 1928, and the property became known as the Grandview Apartments. Mr. Agar serious suffered financial reversals in 1929 and by the early 1930s, the property was in foreclosure. Mr. Agar died in the early 1930s. Debts and judgments against the now deceased Mr. Agar were finally satisfied in 1938 when title to the property passed to the Occidental Life Insurance Company. The Occidental company held the property for five years until they were able to sell it in December of 1943, when it was purchased by John Swanson and his son, Archie. In 1961, with the death of John Swanson, son Archie continued operation of the apartments until 1987, when the court appointed conservator who was managing his affairs, sold the property to Donald L. and Darlene Brus. The Bruses undertook considerable restoration work, restoring stucco and other exterior items. In honor of their efforts, they were awarded a preservation award by the Scott County Historical Society. In April 2008, Darlene Brus, now a widow, sold the property to David Cordes and Bryan Pattschull who continue to maintain and preserve the property. Louis P. Best was associated with many properties in the Davenport Quad City area. Some of those properties were constructed by him, and others were merely owned by him for a period of time. Most of the residential and commercial properties that he owned or constructed remain and retain a high level of integrity. However, only severely altered fragments of the buildings that housed the industries that he operated remain. Because Louis P. Best’s significance to local history was on a broad range of commercial and industrial activity, and that activity continued well into the years that he lived in the 627 N. Ripley Street property, this property is believed to be the best representative property of his productive life. Additionally, it is the only residence that was constructed specifically for him and his family.